Monthly Board Meetings typically take place at 7 pm in the Hospital Board Room the last Tuesday of the month. Contact Vanessa at 208-847-4404 to confirm. Cordell, son of Roy and Phyllis Passey, was raised in the Bear Lake Valley. He graduated from Bear Lake High School where he was active in sports and student government. Upon graduation, he attended then Ricks College after which served as a missionary for The Church of Jesus Christ of Latter-day Saints in the Hawaiian Islands. Following his mission, he married LynAnn Hunter of Bennington and they have four children. Cordell graduated with a degree in Business Administration from Brigham Young University. It was while working toward his degree, he discovered an interest and aptitude for computers. He used to work for the State of Utah until moving back to the valley in 1998. He began working for the school district as well as running his own home business. 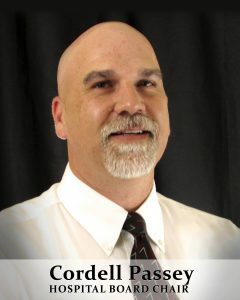 In 2002, Cordell started working for Ireland Bank as their network administrator. He now serves as their Chief Information Officer and Senior Vice-president. Cordell’s favorite hobby is bow hunting in the Fall with his brothers and sons. He also enjoys working outdoors on a small piece of family land he owns in Lanark. His idea of a “fun” day would involve doing some fencing, branding a few calves, and spending time on a tractor. He is looking forward to the opportunity to serve on the Hospital Board and appreciates all that the hospital, as a team, does to help individuals and the community as a whole. Laurie resides in Fish Haven on beautiful Bear Lake. She was born at Bear Lake Memorial Hospital and later worked in the Dietary Department while attending school. She is the President and Owner of Yellowstone Log Homes of Bear Lake. Dedicated to volunteering, she has been very supportive of youth and high school sports in the community (especially softball)! 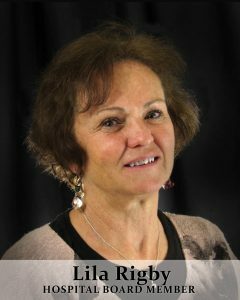 Lila Rigby is a resident of Pegram, and was born in Afton, Wyoming. She was raised on a ranch in Cokeville with six sisters and one brother. She married Keith Rigby and together they have one daughter and two sons. Lila is a teacher in Cokeville. She enjoys the Hosptial Board, which she served on for nine years before resigning to attend to other obligations. After being off the board for about four years, Lila had the opportunity to come back on, and she jumped at the chance. Lila is always amazed at the dedication of Bear Lake Memorial’s employees and their willingness to help make Bear Lake Memorial the most caring hospital. Lila appreciates the many services that BLMH provides for our Valley and hopes to be able to continue to be a part of such a great hospital. 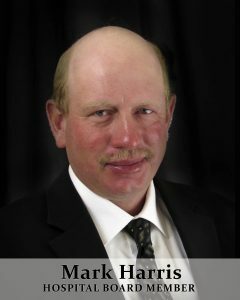 Mark is a life-long resident of Bear Lake County. He was born at Bear Lake Memorial Hospital. He has always called Eight-Mile his home. Mark served a mission for The Church of Jesus Christ of Latter Day Saints in Argentina. He attended Utah State University and graduated with a Bachelors of Arts in Political Science. While attending college, he met the girl of his dreams, Cheryl. They now have three boys, Justin, Seth and Lane. Mark, along with his dad and brothers, run a cattle ranch. During the summer Mark teaches people what it is like to be a cowboy. 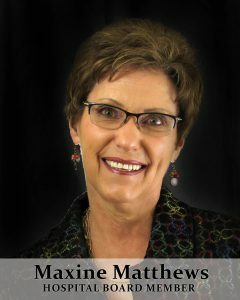 Maxine was born and raised in the Bear Lake Valley. After college, she and her husband, David, returned to this beautiful valley making their home in Paris where they raised their five children. They have all married and have blessed them with 24 beautiful grandchildren. Maxine has had a love for music throughout her life and has enjoyed instructing and participating in many musical opportunities. 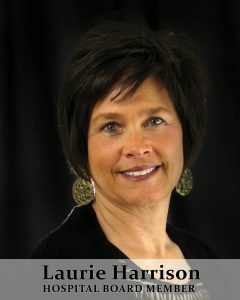 In 2010, she retired from First Idaho Title Company where she gained a knowledge of the real estate and loan business. She is active in her church, civic functions, and is well known and respected in the community. 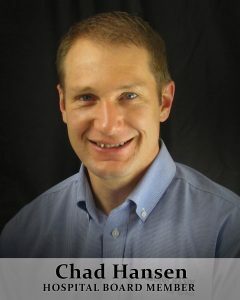 Craig was raised and graduated high school in Laramie, Wyoming. He then attended and played baseball at the University of Wyoming. 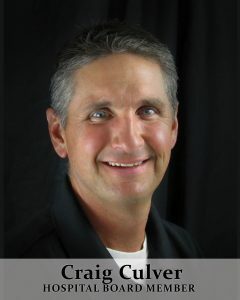 In 1995, Craig took the Art position at Bear Lake High School along with the Head Baseball coaching position. He and his wife fell in love with the valley and now call it home. They have two children; Cason and Caylee who were born at Bear Lake Memorial Hospital. Craig started the American Legion Baseball program in 1997. He has coached baseball for 22 years. In that time, they have had ten District Championships and two State Championships. The Legion program won State and Northwest Regionals in Alaska in 2007. They are only one of two teams in the State of Idaho to accomplish that feat. Craig has also served as an assistant football coach for the past 22 years for seven different head coaches. Craig’s hobbies include fishing, hunting, camping, hiking, and anything else that gets him outdoors. 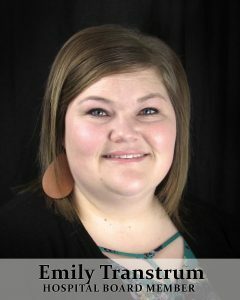 My name is Emily Transtrum. I was born and raised in St. Charles, Idaho on a cattle ranch. I graduated from Bear Lake High School in 2009, and attended college at Utah State University. I graduated in 2013 with a Bachelors Degree in Elementary Education. After teaching 2nd grade for one year at Harold B. Lee Elementary in West Side, I moved back to the valley and have taught 2nd grade for the last four years at A.J. Winters Elementary. I love teaching and spending my days with children. I am sure I end up learning more from them, then they do from me. When I am not teaching I enjoy spending time and working alongside my family, gardening, and reading. I am honored and grateful for the opportunity I have to serve on the hospital board, and to learn more about our great hospital. I am excited to get better acquainted with the hard working employees at Bear Lake Memorial Hospital. We live in a wonderful valley, and Bear Lake Memorial is a great asset to our valley.